Even though I switch up and rotate my skincare fairly regularly depending on how my skin feels and what I think it needs, recently I’ve been sticking to this particular moisturisation dream team from French pharmacy favourite Vichy pretty consistently. 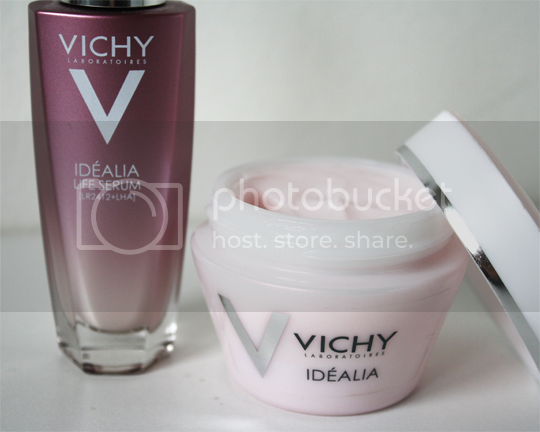 You already know that I loved the Vichy Idealia BB Cream, and here’s what I think about the Idealia Life Serum* and Idealia Smoothing & Illuminating Cream*. Let’s start with the Life Serum. This stuff is awesome. So, we all know that some the very best things you can do for your skin include drinking plenty of water, getting lots of sleep, maintaining a healthy diet and abstaining from smoking and alcohol. However, we also know that doing all of these things isn’t possible all the time and our skin will often suffer for it. That’s where Vichy Idealia Life Serum comes in. It’s designed to combat the effects of the environment and our regular human excesses – think stress, pollution, smoking, those odd days where all we eat is rubbish and don’t even want to think about a vegetable… you know the score. 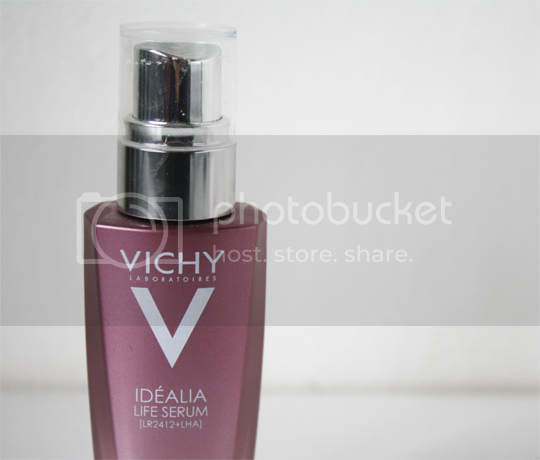 Idealia Life Serum is enriched a very science-y sounding combination of LR2412+LHA molecules, which is apparently how the formula fights against these outside influences on the skin. I have no idea what those molecules are or what they do – but I do know that I love what this serum does for my skin. It’s light and soft, it gives that wonderful plump and hydrated feeling without being at all sticky or greasy, and with continued use I have noticed my skin looking a little brighter overall. My favourite thing about it? Totally irrelevant to performance, but the serum itself has a beautiful pink mother-of-pearl sheen to it when you dispense it. I tried to capture it on camera but it wasn’t happening! Now for the Smoothing & Illuminating Cream. This one is enriched with AHAs (alpha hydroxy acids), vitamins and probiotics which all sounds a lot less confusing than LR2412+LHA molecules, and offers a similar brightening and more refined effect to the skin with regular use. It just helps to give a fresh, healthy and youthful look to the complexion. The texture is lovely too – it doesn’t have that same impressive mother-of-pearl sheen as the Life Serum but hey, that’s just aesthetic. It’s light and airy, with a slightly cool feeling that’s almost like a gel but with the rich moisturisation of a cream. I try not to use this twice daily as it can cause a little bit of excess oil through my T-zone, but once a day seems to be the magic number. I think using both of these in combination has been more effective for me than just using one or the other which I had done in the past – the effects they are having are more pronounced when they’re working in tandem. Plus, it certainly doesn’t hurt that both products (and all of Vichy’s offerings, incidentally) are hypoallergenic, noncomedogenic (i.e. 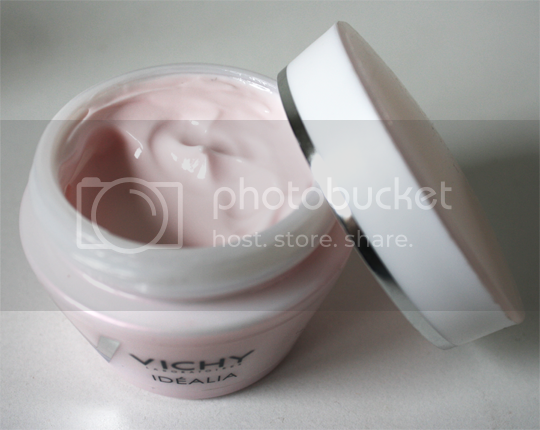 doesn’t clog pores), paraben free and enriched with Vichy’s Thermal Spa Water. I’m really liking both of these and would happily recommend them for combination/oily skin like mine – I can’t speak for those with drier skins but I can’t imagine them disagreeing at all. There is actually a version of the Smoothing & Iluminating Cream specifically for dry skin, too. The Vichy Idealia range is available from Escentual, where you can find the Life Serum here for £25.05 and the Smoothing & Illuminating Cream here for £19.30 – both are currently 15% off!